Last year my most prolific bean was the Blue Lake Runner Bean. My niece and I built two bamboo trellises in between our pineapple guava plants. The beans took over and wrapped themselves around the guava plants as well. Here is a picture of when we first planted in April, then a picture of the beans sprouted in late April and then finally a picture in September of 2013. You can’t even see the pineapple guavas! 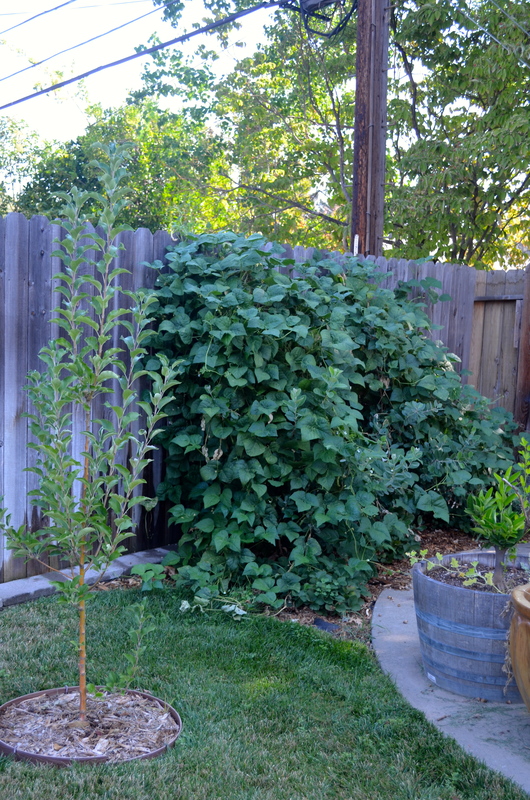 I also made an 8 foot trellis to plant Scarlet Runner beans, saved year after year from my dad’s garden. These flowers of the Scarlet Runners are so beautiful and attracted many pollinators but I ate a whole lot more Blue Lake beans than Scarlet Runners. 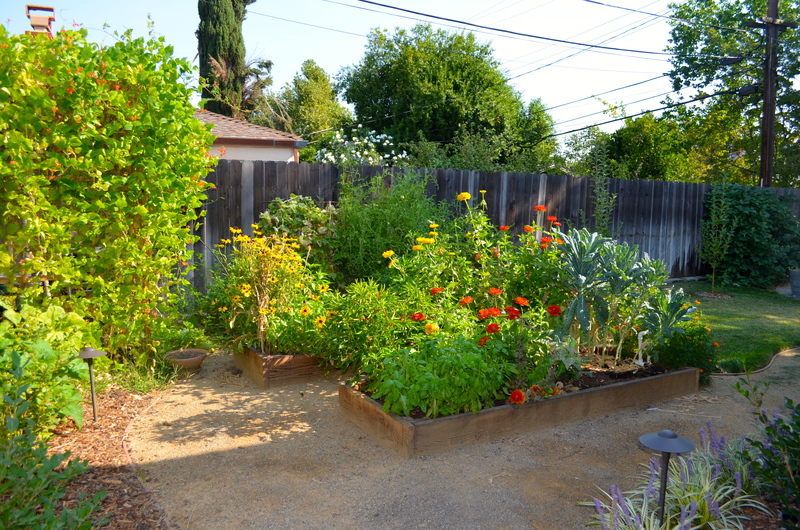 Here is a picture of the trellis which I made partially to screen the compost from view, the second picture you can see the Scarlet Runners in mid-season and then a picture of them in September on the left. I also planted several varieties of bush beans and staked them up using short Mulberry branches. I planted Purple Queen Bush Beans and Yellow Wax Bush Beans. I like planting bush beans because they give you a harvest earlier than the runner beans. I also tend to plant these in my raised beds so they give back to the soil. They also are a faster crop than runner beans. Bush beans tend to put out lots of beans at once and then the plant is done whereas you can harvest from runner beans all season. It is nice to have a mix in your garden. I harvested 4.21 pounds of bush beans and 15.25 pounds of runner beans in 2013. After the 2013 bean season was over, I let the plants die on their trellises. I collected some seeds from the best specimens. Then I cut the bean plant at the base leaving the roots intact in the ground. I chopped the plants into smaller pieces and lightly dug them into the ground. Beans are soil builders. Their roots fix nitrogen into the soil which benefits following crops of heavy feeders. This is why I use the chop and drop method of cleaning up my beans. Plus it is hard to keep up with all the biomass at the end of the summer so dropping them in their place helps free up space in my compost. Orient Wonder Pole Yard Long Beans in the herb garden. Trionfo Violetto Pole Bean climbing up a corn. The corn blew over in strong wind the other day so I am not sure how successful the bean or the corn will be. Trionfo Violetto climbing up Mulberry canes attached to the support cables from the power lines. 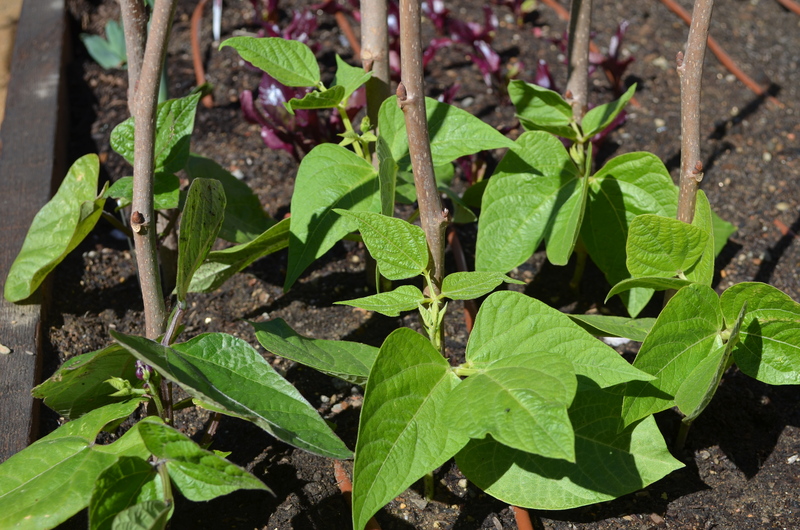 Tags: beans, Bush Beans, drying, harvesting, Runner beans, seed saving, soil builders, trellis | Permalink.